African forest elephants have an extremely slow birth rate, putting them under greater pressure from poaching, research suggests. Scientists have found that the animals start to breed at a later age and with longer intervals between calves than other elephant species. The researchers say it means it could take decades for this species to recover from recent dramatic declines. Prof George Wittemyer, from Colorado State University, US, and the chair of the scientific board of Save the Elephants, said: "I don't think any of us realised how sensitive this species was. "The basic biology of this species is designed for a system where they grow slowly, where they increase in number slowly, and the pressure we're putting on them to harvest ivory is simply too much for them to bear." African forest elephants inhabit the dense tropical jungles of central Africa. 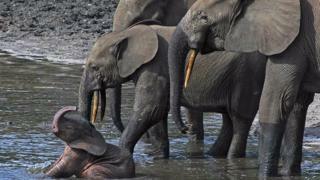 They are smaller than savannah elephants and rarer, but they have faced intense poaching. A recent study estimated that their population declined by 65% between 2002 and 2013. However, until now, little has been known about their demographics. This latest study looked at more than two decades' worth of data recorded in the Dzanga forest in the Central African Republic. Andrea Turkalo, from the Wildlife Conservation Society (WCS), monitored the comings and goings of more than 1,000 elephants who visited a clearing in the forest. These long-term observations enabled the team to assess the animal's reproduction rate for the first time. "Female forest elephants in the Dzanga population typically breed for the first time after 23 years of age, a markedly late age of maturity relative to other mammals," she said. "In contrast, savannah elephants typically begin breeding at the age of 12." The scientists also found that forest elephants produced a calf every five or six years, whereas savannah elephants gave birth every three to four years. The researchers say the findings suggest that forests elephants could take longer to recover from poaching than was previously thought. "Even the Dzanga elephants, which have experienced less poaching than we have seen in other sites in the forest - if they were to recover to the population size they had in 2002, it would take 90 years," said Prof Wittemyer. "If we can stop poaching, they can recover a bit faster, but we are still talking about decades to get populations back to what they were in 2002." He added that forest elephants were facing a very real risk of extinction. "We are talking about the loss of one of the planet's most unique, one of the largest, and probably most cognitively advanced animals on the planet. We are really facing the potential to lose this animal in the wild - and that's because we have not been able to stop poaching."